These nodes take an input value, modify it, and return an output value. For these nodes PixaFlux support a system that grows the inputs sockets as new inputs are connected. When an image value is connected to the last input of the Transform node, a new input-output pair is added to the node. Outputs are only affected by their pair input and the attributes. This type of node take many inputs and processes all them together to return one output. As new inputs are connected, new input sockets are added to the node. The Mix node is an example of this node type. 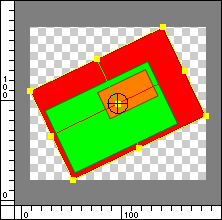 All image values connected to a Mix node are composed together using the same composition type. All inputs affect the output.